The Vedas teach us that God incorporates in fullest the six perfection to which we all aspire. He has full strength, full fame, wealth, knowledge, beauty and renunciation, At the same time, He is the best friend of all living beings. Although wishing only the best for us, He respects our free will. When we choose something that will hurt us at the end, He, residing in our heart in the form of Paramatma (Super Soul), tells us that this is not the best way to act. If we insist, He allows us to learn our lesson. When we feel fed up with the results of our free will, which promise happiness but always end in frustration, we start seeking the information, which is based on transcendental platform. Thus, we have a chance to learn that all opulence can be given to us only by one who has it Himself, i.e. the God. However, why should He share it with us? The answer is clear: He is our best Wisher and is waiting for us to remember this. At this point our journey back home begins. This way is a way of transformation, a way of loving service to God and all His creatures. A central part of this is mantra meditation. There are two types of such meditation. Kirtan is the singing of mantras with others. The singing is accompanied by music and the audience is encouraged to participate by chanting, clapping, and dancing. Japa is private meditation, where God’s names are chanted softly on prayer beads called mala.The beads used are of various types. Malas can be made of Rudraksha seeds, stems of the Tulasi (Basil) plant, shells, lotus plants, gold, precious stones, pearls, crystals, etc. One complete Mala involves the repetition of the Mantra 108 times. The 109th bead acts as the guide. 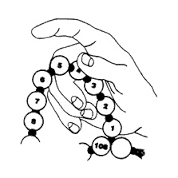 An important rule is not to cross over it on completion of a Mala but retract and do the next Mala commencing at the point of finishing the previous Mala. Thus, we work back and forth from the summit. There are 27 Nakshatras or Heavenly Bodies that regulate our destinies. Each Nakshatra enters 4 phases in the course of an astrological day. Therefore, all the Nakshatras pass through 108 phases (27 x 4 = 108) during any day. The Shastras (scriptures) say that the God is symbolically represented by the figure 9. The three figures in the number 108 add up to nine (1 + 0 + 8 = 9). The figure 9 itself when multiplied by any other figure and the digits of the answer when added up will provide the answer as exactly 9. The number 108 has held a multi-dimensional meaning throughout history. In geometric terms, it is a natural division of circle (108=36+72=9 X 12). 108 is a number known to be referring to spiritual completion; Hindu deities have 108 names, and there are 108 gopis of Vrindavan. In Japan, at the end of the year, a bell is chimed 108 times in Buddhist temples to finish the old year and welcome the new one. Each ring represents one of 108 earthly temptations a person must overcome to achieve liberation. Zen priests wear juzu, a ring of prayer beads, around their wrists, which consists of 108 beads. The Lankavatara Sutra has a section where the Bodhisattva Mahamati asks Buddha 108 questions. In Kriya Yoga, the maximum number of repetitions allowed to be practiced in one sitting is 108. 108 Sun Salutations in yoga practice is often used to honor change, for example, the change of seasons, or at a time of tragedy to bring peace, respect, and understanding. It is said that if one can be so calm in meditation practicing pranayama to have only 108 breaths a day that enlightenment will come. There are 108 energy lines, or nadis, converging to form the heart chakra. Marma points are like Chakras, or intersection of energy, with fewer converging energy lines. On Sri Yantra, the Marmas have 54 intersecting energy lines where three lines intersect. Each has feminine and masculine qualities. 54 X 2 =108. The Sanskrit language has 54 letters, both representing the two genders 54 X 2= 108. The distance between the Earth and Sun is 108 times the diameter of the Sun. The diameter of the Sun is 108 times the diameter of the Earth. The distance between the Earth and Moon is 108 times the diameter of the Moon. The universe is made up of 108 elements according to ancient texts. There are 12 constellation and 9 arc segments. 9 times 12 equal 108. The 9 planets traveling through the 12 signs constitute the whole of existence. 9 x 12 = 108. The Vedanta, according to the Hinduism tradition, recognizes 108 authentic doctrines (Upanishad) aiming to approach the Truth and to destroy Ignorance. In Jain tradition, it is believed that they are 108 virtues. Brahma’s lifespan consists of 311 040 000 000 000 human years. The digits of each of the above figures when added or the digits of those answers when added will produce the number 9. The number 9 represents Infinity. 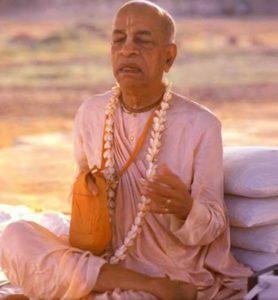 TODAY’S TIP: In Bhagavad Gita the Lord says “… among words, I am the monosyllable Om; among sacrifices, I am the sacrifice of silent repetition” (10:15). By chanting the Divine Name, we address the personal Bhagavan (the Personality of Godhead); while by chanting Om, we address the impersonal Brahman. You can only love a person; you cannot love the impersonal absolute. Successful chanting of Om enables us to develop freedom from suffering. However, not to suffer does not mean becoming happy. By chanting the God’s name we obtain the highest bliss of personal, loving relationship with God. See also: “Origin, Structure and Goal of Vedas”; “Hare Krishna Maha Mantra”; “Vedas on Cosmos”.